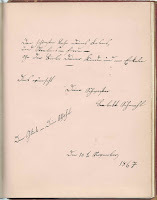 Oversized 1854-1888 autograph album that belonged to Matilda Elizabeth Schmahl before and after her marriage to New York merchant Anton W. Miller. Matilda did a pen and ink drawing in 1852 entitled "The Signers of the Declaration of Independence" that is held by the Smithsonian. 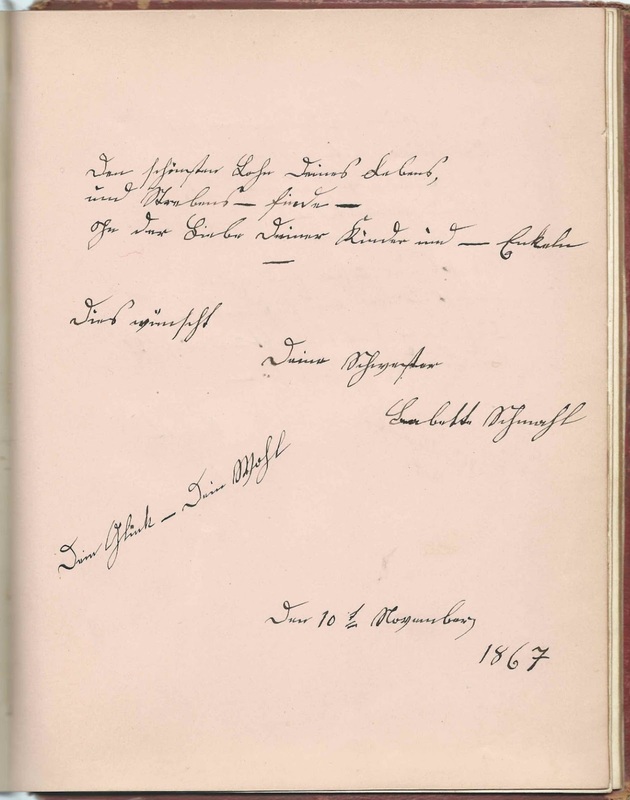 The autograph album measures approximately 9-1/4" x 8" and contains the sentiments of about 26 of Matilda's friends and teaching comrades, as well as her husband or future husband Anton W. Miller, who is presumably the A. W. M., who inscribed a page in English and the overleaf in German. 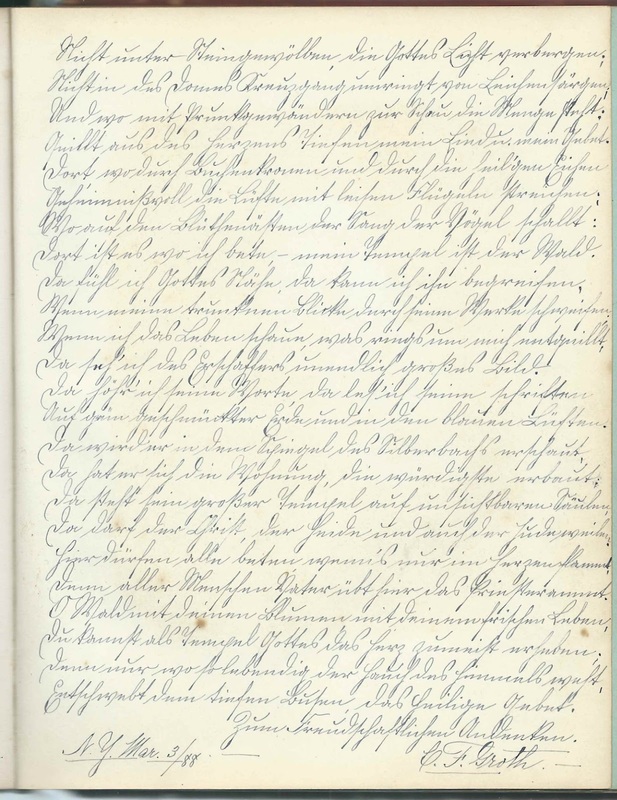 Someone, presumably Matilda herself, wrote full names at the bottom of several pages where the inscriber had written initials or just a given name. 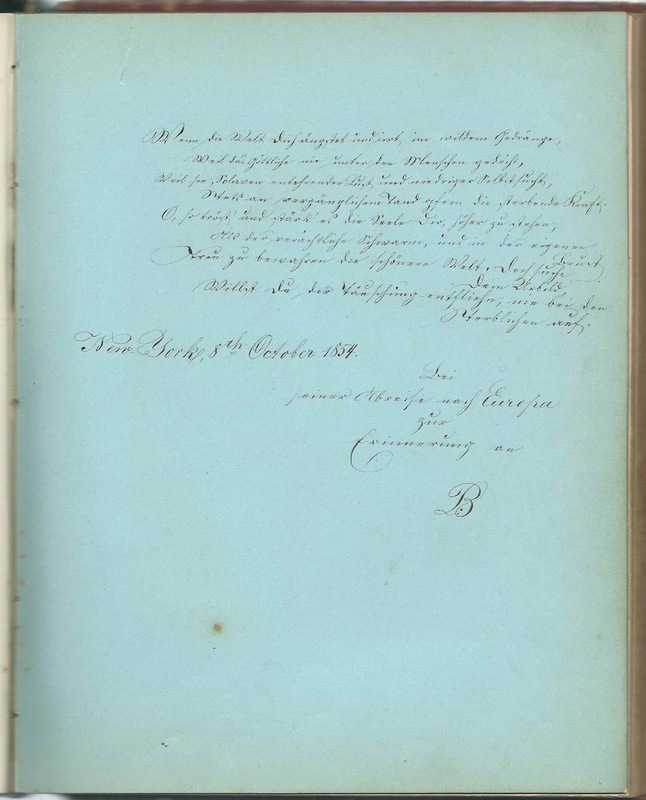 An alphabetical surname list and and alphabetical list of the inscribers, together with any personal information they offered, appear at the end of this post. 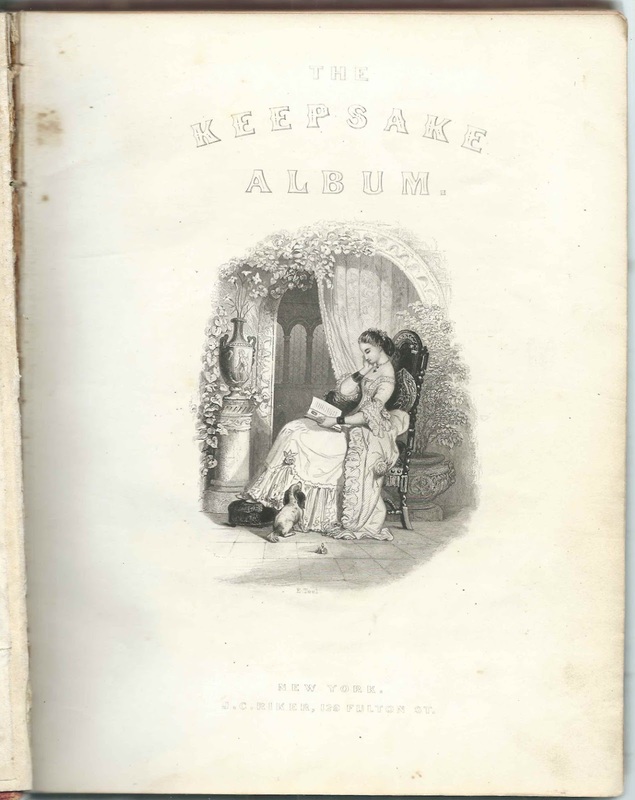 The album, published by J. C. Riker of New York, also contains 15 full-page engravings. Matilda Elizabeth Schmahl was born about May 1837 at Newark, New Jersey, the daughter of German immigrants Philip and Philippina (Seiler) Schmahl. 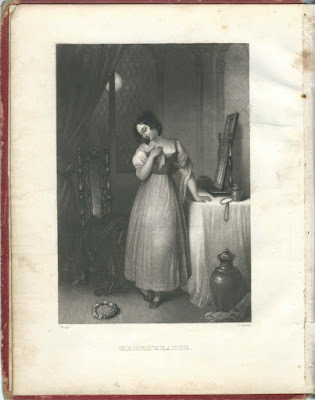 I believe Matilda had at least 5 siblings, one of whom, her older sister Eliza, lived with Matilda after the latter's marriage and may have been the Eliza who inscribed a page in the album in 1856. 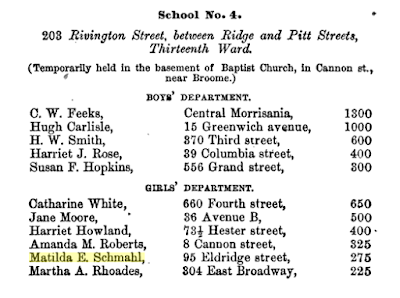 In an 1854 publication of the New York Board of Education, Matilda was listed as a teacher in the Girls Department at School No. 4, located at 203 Rivington Street, between Ridge and Pitt Streets in the Thirteenth Ward, then temporarily located in the basement of the Baptist Church in Cannon Street, near Broome. 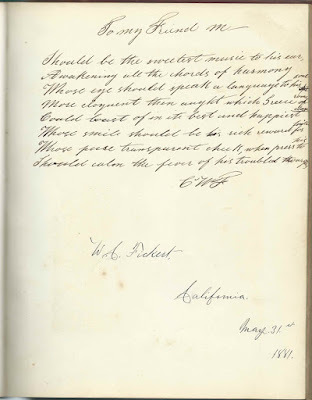 Interestingly, four of the teachers in that department inscribed pages in her album: Catharine White; Harriet Howland; Amanda M. Roberts; and Martha A. Rhoades. At the time, Matilda was living at 95 Eldridge Street, and her salary was $275. 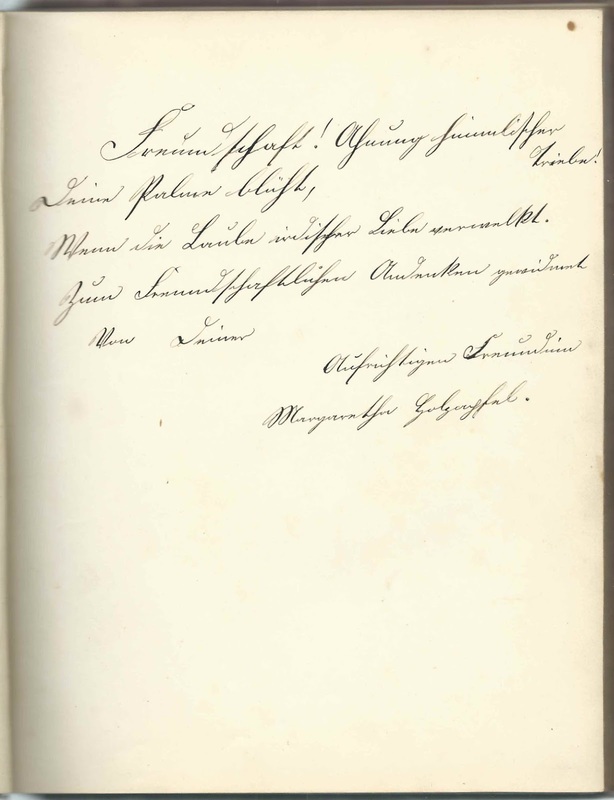 Some time in the mid 1850s, Matilda married Anton W. Miller, who, according to his 1896 passport application, was born May 3, 1828 at Alzei, Hesse-Darmstadt, Germany. Anton arrived in the United States in October of 1842 and was naturalized on May 17, 1849. On the passport application, he gave his address as 227 East 115th Street, New York, New York, but wanted the passport sent to the care of August L.Martin at 66 Broadway, in New York City. Ida Miller, born about 1860 in New York; married Walter T. MacDowell. Matilda and her sister Eliza lived with the MacDowell family for a time. Anton W. Miller, I believe, died in 1896, perhaps while on a trip to his home town, Alzei, in Germany, the reason he had requested a passport. Matilda Elizabeth (Schmahl) Miller died in 1906 at Shandaken, New York, where she was living with the family of her daughter Ida (Miller) MacDowell. 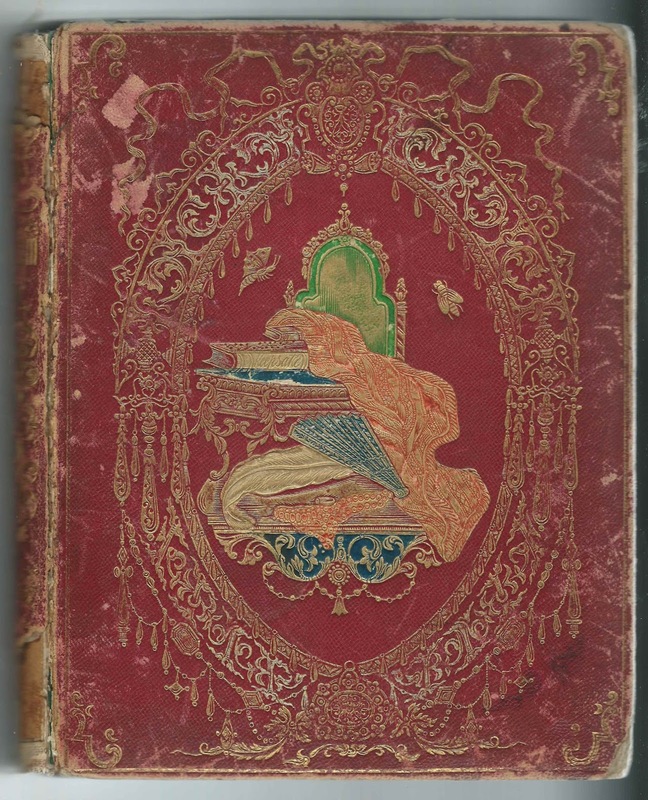 One page was inscribed by C. W. Fickert and W. C. Fickert at California in 1881. I believe they were German native Charles W. Fickert and his son William C. Fickert who had moved from the New York City area to Tehama County, California. Inscribers in the Album - given names within a surname might not be in alphabetical order. B, inscribed at New York on October 8, 1854. 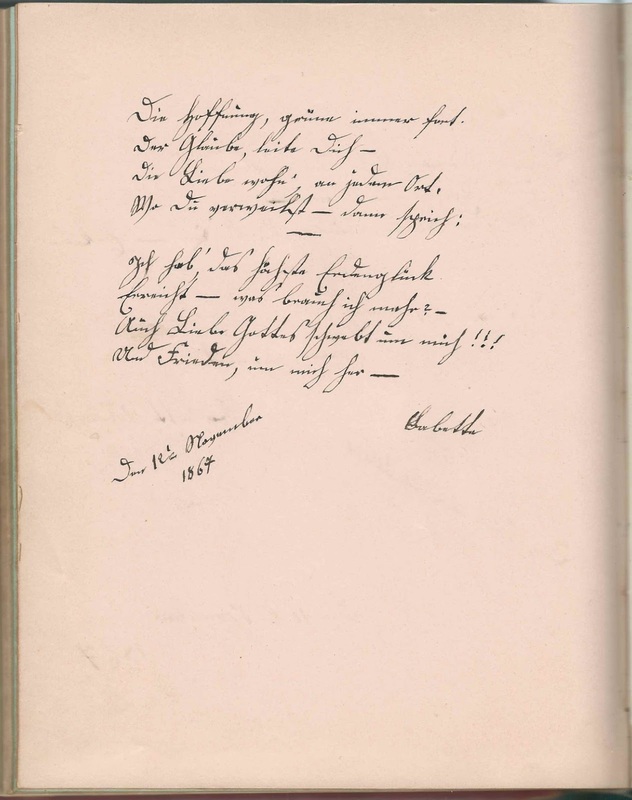 Half-page sentiment, inscribed in German; asks Matilda to remember B when Matilda leaves for Europe. 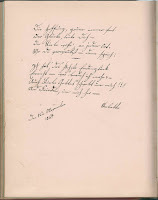 Liesbeth, inscribed in German on November 12, 1867; she may have been Matilda's sister, who inscribed a page two days earlier. 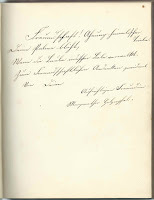 Page inscribed in German by P. H. at New York on October 11, 1855. Fancy calligraphy and a scroll and quill pen sketch with wording incorporated into the scroll. A, inscribed at New York in November 1855. Identified as Benjamin B. Atterbury in a note left at the bottom of the page, presumably by album owner Matilda. In the 1854 New York Board of Education publication listing Matilda as a teacher, a Benjamin B. Atterbury is listed as Chairman of the School Committee of the School for the Society of the Reformation of Juvenile Delinquents, or House of Refuge. 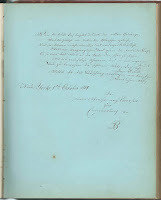 Albertine; identified as Albertine Cooley, in a note at bottom, presumably left by Matilda herself. Harriet, inscribed on July 4, 1854. Identified as Harriet DeLong in a note at the bottom of the page, presumably left by album owner Matilda. 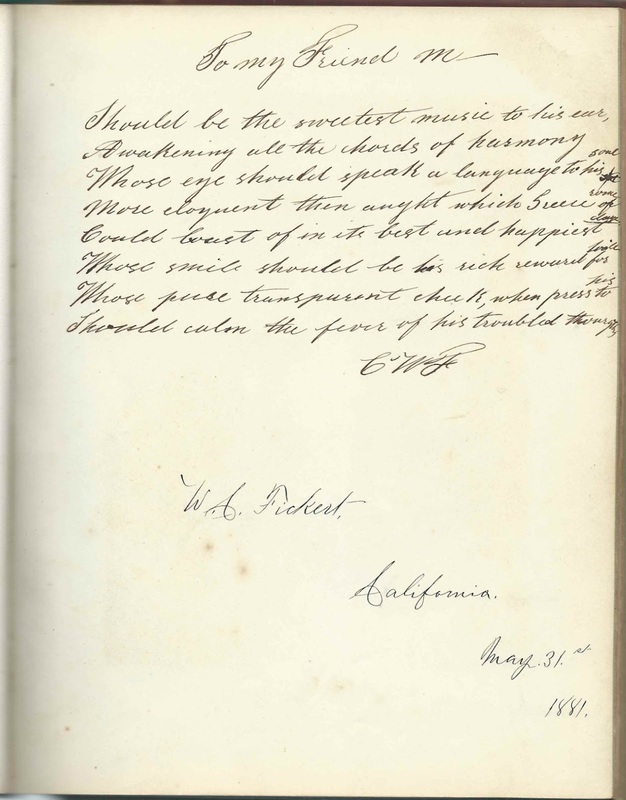 C. W. F.; presumably Charles W. Fickert, who shared the page with his son William C. Fickert, who inscribed his page on May 31, 1881 in California. Hattie; identified as Harriet Howland in a note at the bottom of the page presumably left by album owner Matilda. S. A. J., inscribed on March 24, 1859. Like Matilda, Harriet Howland was a teacher in the Girls' Department at School No. 4, at 203 Rivington Street, but held temporarily in the basement of the Baptist Church in Cannon Street, near Broome. 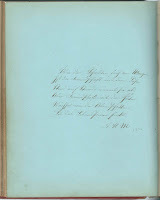 A. J., inscribed at Brooklyn, presumably New York, on March 24, 1859. 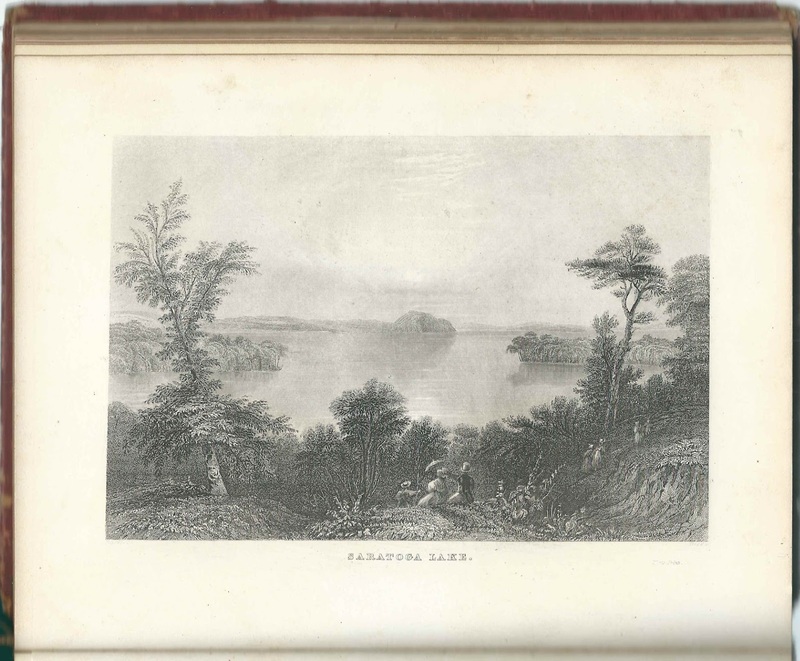 Identified as Adelia Johnson in a note at the bottom of the page, presumably left by album owner Matilda. S. A. J., inscribed on March 24, 1859. 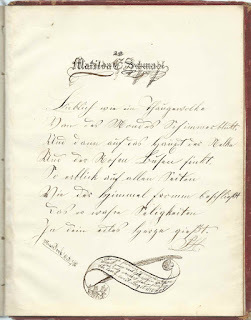 Identified as Sarah A. Johnson in a note at the bottom of the page, presumably left by album owner Matilda. 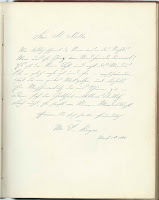 Emily, inscribed on April 2, 1856. Identified as Emily McKinney in a note left at the bottom of the page, presumably by album owner Matilda. There was an Emily McKinney listed as a teacher in the 1854 New York Board of Education publication that also listed Matilda as a teacher, but they were at different schools. A. W. M., inscribed in 1854, inscribed in English; inscribed the overleaf in German. Presumably Anton W. Miller, Matilda's husband or future husband. Louisa; identified as Louisa Mosher in a note at the bottom of the page, presumably left by album owner Matilda. Martha, inscribed on May 8, 1854. 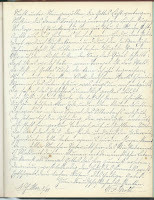 Identified as Martha Rhoades in a note at the bottom of the page, presumably left by Matilda herself. Martha sketched a flourish at top with "Lines for Matilda" incorporated into it. 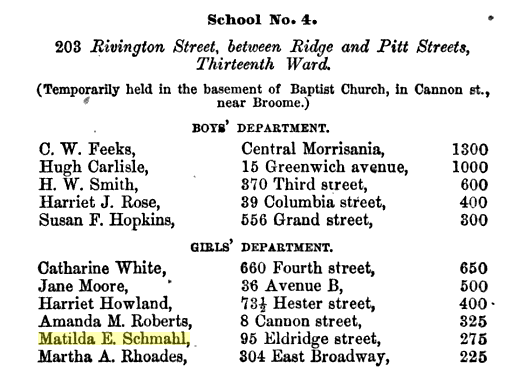 Like Matilda, Martha A. Rhoades was a teacher in the GIrls' Department at School No. 4, at 203 Rivington Street, but held temporarily in the basement of the Baptist Church in Cannon Street, near Broome. 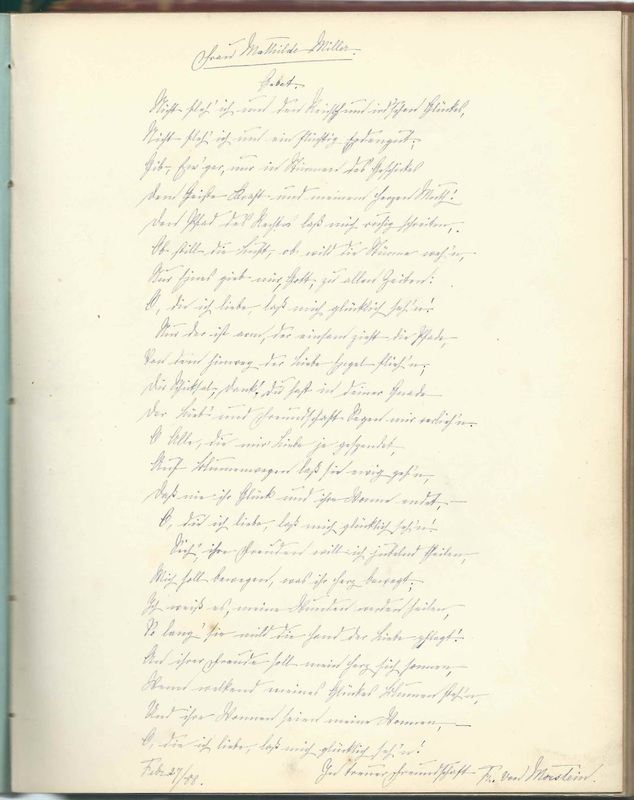 Amanda, inscribed in May 1854. 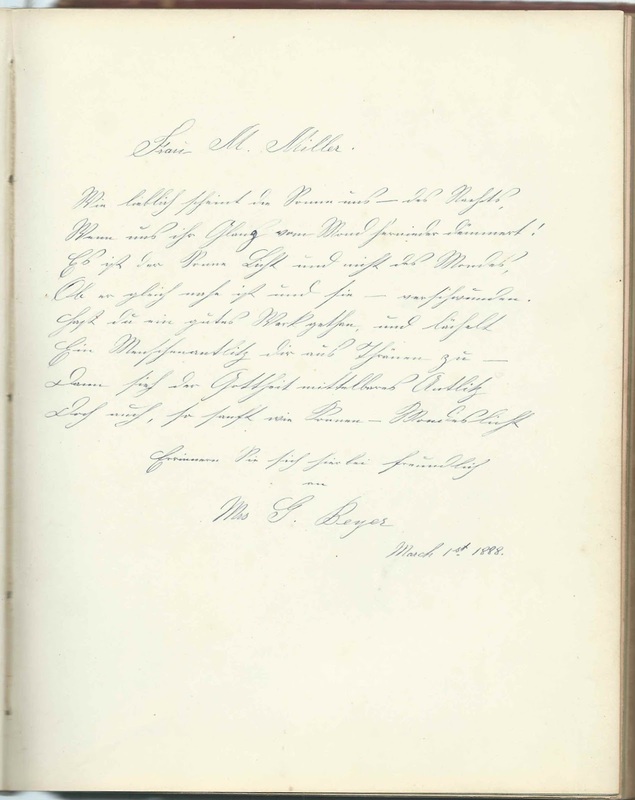 Identified as Amanda Roberts in a note at the bottom of the page, presumably left by album owner Matilda. Like Matilda, Amanda Roberts was a teacher in the GIrls' Department at School No. 4, at 203 Rivington Street, but held temporarily in the basement of the Baptist Church in Cannon Street, near Broome. 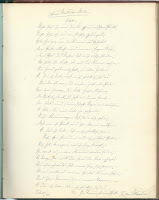 R. S. T., inscribed on October 19, 1861; identified as Rebecca S. Tryon at the bottom of the page in a note left presumably by album owner Matilda. Catharine, inscribed on February 5, 1856. Identified as Catharine White in a note at the bottom of the page, presumably left by album owner Matilda. Catharine designed several flourishes around Matilda's name and that of her own. Like Matilda, Catharine White was a teacher in the GIrls' Department at School No. 4, at 203 Rivington Street, but held temporarily in the basement of the Baptist Church in Cannon Street, near Broome.